Founder and Director of National Dance Institute (NDI), Mr. d’Amboise is recognized as one of the finest classical dancers of our time. Mr. d’Amboise began his classical training at the age of eight at the School of American Ballet, studying with George Balanchine. At age twelve, he was asked to perform with Ballet Society, the immediate predecessor to New York City Ballet (NYCB). Three years later he joined NYCB. 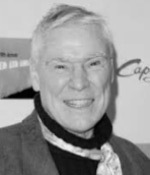 In 1976, while still a principal dancer with New York City Ballet, Mr. d’Amboise founded National Dance Institute.